Experience The New Tandra Active Image CD-ROM Today! Announcing the release of Broken Faith, the new Active Image CD-ROM from Hanthercraft Publications! Now you can live the first Tandra adventures exactly as they are intended for viewing, presented in both popular JPEG bitmap files and high resolution PDF format allowing you to choose the Tandra Experience of choice. The Active Image Tandra CD-ROM is presented in full digital RGB colour, and not just colour for the sake of colour! Hanther has personally added colour to each page with the demands of the story in mind. The fabled blue green skies of Tandra are now the perfect shade of blue green. Events occurring after sunset are tinted in shades of night. Sun scorched desert sands now burn with bleached colour and jungles are steam sodden green. This is Tandra as Hanther always envisioned it in his mind and as you have never experienced this incredible world...until now! Tandra is the story of David Galon of Earth, a take no prisoners hero who rescues Kenia, an exotic beauty, from street gang thugs who have trapped her in the back alleys of a large American city. Galon falls instantly for the mysterious woman. She returns his love, but she has secrets she refuses to reveal. The mystery only makes her more fascinating until the day a strangely dressed mediaeval warrior comes to report her father is dying and requires her presence. It is then Galon discovers the lady to whom he has given his heart is a princess from another world, a world that can be reached by simply walking through a specialized Star Door, something of a passage between worlds and a tunnel through deep space. In defiance of her demands that he not follow her, Galon smashes through the Star Door and into the universe of Tandra. Seeing his princess board a distant sky craft, Galon races to catch her, but is unable to reach her side before the weird sail craft takes her high into the Tandra skies beyond his reach. Thus begins Galon’s perilous quest for his princess, a journey that takes him over a strange and hazardous world, bringing him face-to-face with incredible and savage creatures, beautiful and dangerous women, formidable enemies, and questionable allies! Tandra is a rich and complex world, the remains of a once great civilization now fallen back into a savage age where small city-states and their amoral rulers struggle for power and survival, a world where sudden death lurks in every shadow borne on the blade of treacherous assassins or on the lips of seductive women. Tandra is a world regressed to the extremes of dark superstition where the terror most feared is the threat of the dread race of Wizards who, it is said, constructed the high technology Wizard Ring, a silver band that arches high over the blue-green skies above. This is the world David Galon of Earth must face to reclaim for his own the wondrous and exotic Princess of the Dragon Throne. Ever remaining is the essential question; should the Earthian succeed in finding the woman of his dreams, will she still care for him or will she have abandoned his love? Is her interest in David Galon nothing more than of a brief encounter to be casually cast aside once the moment has passed? If such is indeed the case, Princess Kenia, heir to the Dragon Throne, may well discover the Earthian Galon is no witless player in other worldly power games, to be cast aside when no longer required! Tandra is an American Saga created for today’s American audience of the twenty-first century. The psychotic and fanatical self styled political and religious monsters who have no hesitation of any crime or vicious act in the quest for power over men are a reflection of the repulsive degraded would be tyrants of our own time. The drooling priest Earthian Galon smashes back against a stone wall on Tandra is of the same persuasion as the bloodthirsty fiends who would rule us on Earth today and the leering tyrant who orders the execution of his foes to secure his own power is one with the politician whose face you see on the morning news. You will discover the fell creatures of Tandra are not simply foolish and harmless clowns in long underwear and funny masks you can laugh about and forget after dinner. They are sub-human monsters with blood on their hands and murder in their hearts transported to another world where they are drawn with broader strokes and where they can no longer hide behind the shield of the politically correct. Thus revealed, they face the vengeance of a hero who dares to defend their victims and repay their cruel viciousness in kind. You can order your copy of the Tandra Active Image CD-ROM, Broken Faith, today by clicking on the Tandra Add To Cart button in the bottom right corner of this page and selecting the Tandra Active Image CD-ROM, Broken Faith, right from our store, or you can request your copy by phone by dialing 1-800-634-4050 or by sending a personal E-mail to [email protected] right now. The Tandra Active Image CD-ROM, Broken Faith, is an exciting new concept in the publication of comics and picture stories; The Tandra Active Image CD-ROM, Broken Faith, is what happens when the comic book encounters the digital age. What, you ask, is included on the new Tandra CD-ROM? -The complete and enhanced in full colour original Tandra Graphic Albums, a total of 226 pages of the ground breaking Tandra illo-epic. Many of the pages have been completely redesigned for this revolutionary new release. These pages provided in both JPEG bitmap and Adobe Acrobat PDF formats to allow for your viewing preference. -Two exhaustive in-depth interviews with Hanther, creator of the Tandra Universe. Discover the untold story of the inspirations for Tandra and how the series came to be. 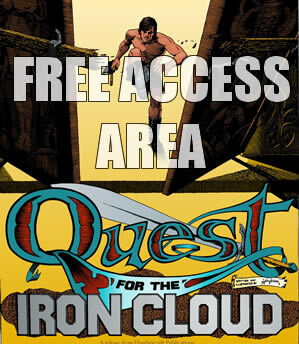 Then learn how the pages of this incredible epic and visual feast are created, from concept to finished colour. -Stories by Ms. Libby Singleton of the Tandra Universe including the critically praised Krallyn story and also her series of Titian, the woman who created a world. Ms. Singletons Tandra stories explore Hanther’s Tandra with a fresh outlook and an exciting new perspective. -The essential Tandra Characters and Places Cross Reference Guide that reveals long guarded secrets of how characters and story elements were inspired and developed for the Tandra Universe. The essential reference for how Tandra came to be! -The definitive Timeline Reference Table with dates and events linked to the specific Tandra plates noted. -As an additional feature you will find the collection of Hanther’s Charlie’s Truck Stop feature as appears weekly in newspapers. These commentaries are opinionated, biased, extreme, political, sometimes humorous, occasionally wrongheaded, and always entertaining. They also provide stunning time capsule snapshots of world conditions at the time they were written. -Also included are many more features both informative and entertaining that add up to hours of enjoyment in a great new format. 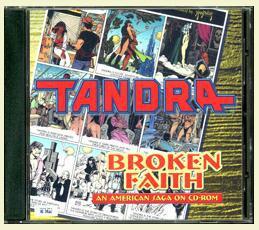 The Tandra Active Image CD-ROM, Broken Faith, is truly unlike any comic book you have ever seen. The pages are created in Adobe Acrobat so you know the screen images are superior. Navigation is a breeze using the native Acrobat tools and/or the page links included with the document, whichever you choose. For those readers who, like Hanther, are not comfortable reading from a computer monitor, the pages can be printed out with ease for storing in a folder and taking to the beach or for just relaxing in the back yard on a warm summer evening. The Tandra Active Image CD-ROM, Broken Faith, is available cross platform for both Mac and PC and includes all the tools needed for viewing and navigation. Its simple really. All you do is click on the Tandra Add To Cart button in the bottom right corner of this page for a secure link to pay by credit card or, if you prefer to order without using a credit card, you can send us an E-mail to [email protected] and tell us you want a copy of the Tandra Active Image CD-ROM, Broken Faith, or you can simply pick up the phone and call toll free 1-800-634-4050 to request your copy of the Tandra Active Image CD-ROM, Broken Faith. We will include an invoice inside the CD package and you can pay by return mail. That’s all there is to it. Within days you can experience the exotic and fabulous Tandra Universe right in the comfort of your own home and the beauty of your visit to Tandra is you will not be required to pay a single penny for transportation fuel. With gasoline prices as they are today, that is a definite plus. 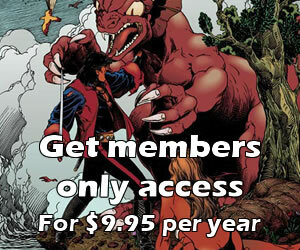 So, own a landmark icon of comic book history. Enjoy the next generation in graphic narrative publication. Visit another universe from your computer. Be the envy of your neighborhood with the newest technological innovation. Spend money! What are you waiting for? Order your copy of the Tandra CD-ROM now! Experience Tandra in wonderful RGB colour. This is the first Tandra Active Image CD-ROM. There will be others!